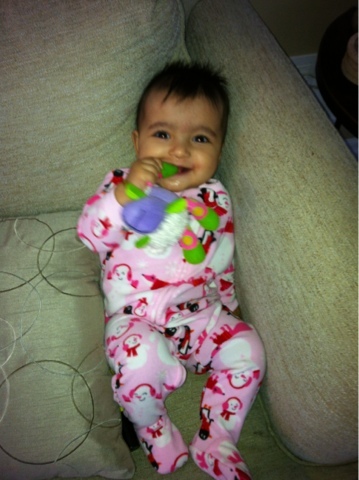 Happy 7 month birthday, Miss Anjali-lo. You are such a sweet baby with a pleasant disposition. We enjoy your smiles and personality more and more everyday. Here are a seven things I have learnt about you, Miss Anjali in your seven months. 1- You are a great sleeper- 2 naps per day and 12-14 hours straight per night. We'll take it. 2- You growl when you're chatting with us. It's kind of scary, kind of funny. 3- You ADORE your big sister and look at her with a combination of fear, surprise and delight. I think you will grow up to be great friends. 4- You don't really adore food that much but if you have to choose, you would have fruit purees. Peach and nectarine are your favourite. However, when I gave you a touch of the family's spiced butternut soup , you lapped it up. It must be all the spices you're being introduced to in utero and via me. 5- You have been teething for the longest while. Lots of drool and sensitivity and just one teeny tiny tooth. 6- You love routine but love a trip out too- just as long as it is on your time. 7- You love bath and could spend hours in the water-- unless you're sleepy. then it's all bets off. We love you so much and can't what to see what this month brings! She is absolutely precious!!! What a beauty! Oh my goodness did you find this in your drafts? SO sweet!